You know when you volunteer to bring in food for a class party and you get there, and there is a ton of food and you know the kids are just going to take a bunch, eat some, and then a lot of it is going to go to waste? And then you think, “ugh. What a waste. And who brought donuts? And can I silently judge that person and eat one of the donuts at the same time?” Then there all these moms standing around, and you know there is work to be done, but you can’t quite figure out what you are supposed to do? Or all the easy jobs are taken and you don’t want to do the hard or complicated or boring ones? NO? Is it just me? Big redacted section on the reason for this particular breakfast and why I thought the idea wasn’t that great and why I volunteered to make whole wheat pancakes. I volunteered to bring in pancakes for a class breakfast. And in my mind, I was one of many parents who would be bringing in pancakes or something. I didn’t write down the date of the breakfast for some reason, so I was glad and horrified when I got the email saying to be at school on a certain day at 7:45am to start cooking so all the food would be ready for 60 kids by 8:05. 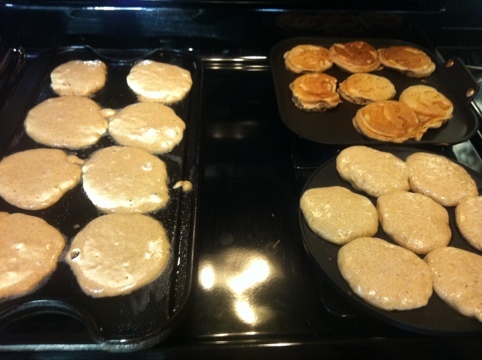 (Side note – there was one other mom cooking pancakes that day.) Between when I volunteered and when the day arrived, I found out I would have work to do between 8:00 and 8:30, so I asked if I needed to stay and help, which I am sure was expected, but I thought I could shirk it because there would be so so so many other volunteers, but at least I was planning ahead when I said, “I am going to make the pancakes at home, and how long exactly do I need to stay and help because Mondays are crazy at work…?” I didn’t hear back. Now, I would never complain about Dave, especially on my blog, so this next section is really about me, and how awesome I have become after 14.5 short years of marriage. I tried to pawn the pancake helping duties off on Dave. There was a miscommunication. Me: Here are 80 pancakes. I don’t know how long you’ll have to stay and help out. Dave: I don’t have time to stay and help out. I have to work. Me: Yeah. That’s what I said. Then Dave left to drop off 80 pancakes and 2 kids. I sat at home working. And thinking. I thought about how I was extremely worried about how 4 teachers could possibly manage to feed 60 kids pancakes. What if there were no other parents to help? WHO WOULD WIPE DOWN THE TABLES AFTERWARDS? Of course, maybe the tables wouldn’t be sticky if there was no syrup? I started to imagine myself getting really mad at Dave, and then I thought, who cares? A younger MegaMegan could have been angry for weeks about this. But really. Not worth it. I have officially grown as a person. When Dave got home, I found out which moms were there and I txted them my thanks for covering for me. Those moms know what to do at class parties. I probably should buy them each a glass of wine. So now that I am so mature that I can recover from a miscommunication/argument in less than an hour, the next step is to not be a freak show in the first place. But that would make for pretty boring blog posts. This entry was posted in food, Parenting, Uncategorized, Working Mom on March 8, 2012 by metamegan. I’m so glad to know I’m not the only one having junior-high level anxiety about elementary school parties. I’m the mom wiping down the tables and glaring at the cool moms standing around gossiping to each other. Good thing our kids don’t go to the same school!